With the Dubai Shopping Festival (DSF) concluded after a month packed with sales, fashion shows, parades, concerts and malls brimming with activity, there’s no better time to examine the shopping event’s popularity in the region, as well as the UAE’s shopping habits in general. Whether shopping at the nearest mall, shopping online for the newest gadgets, or even visiting the country to take part in the enormous sales, the love of shopping is very much alive in the UAE. According to a recent YouGov Omnibus, as many as 60 per cent of GCC residents (excluding those already living in the UAE) are aware of the Dubai Shopping Festival. Additionally, 14.7 per cent of respondents are planning to visit (or are already visiting) Dubai for the shopping festival. This number is highest in Oman (with 21.1 per cent), followed by Bahrain (17.8 per cent) and Qatar (17.4 per cent). When it comes to payment methods while in the UAE, 63 per cent of respondents who say they are at least somewhat likely to visit Dubai in the next three months plan on using credit cards as a payment method. This number is followed by 60 per cent who said they’d use cash, and 25 per cent who chose debit cards as a payment method. Notably, the only respondents who didn’t choose credit cards as their preferred method of payment were Omani residents at 49 per cent. When it comes to UAE residents, YouGov Cube data – looking at an average sample of more than 6,000 UAE residents – shows 52.6 per cent of respondents shop at malls or stores at least three times a month. 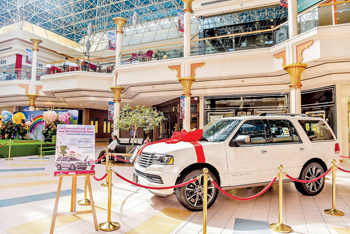 There’s no shortage of fervent shoppers in the UAE either, with 22.6 per cent of respondents stating they shop at malls or stores more than six times a month. Notably, this number is almost identical between men and women, with 23 per cent of women and 22.3 per cent of men stating the above.